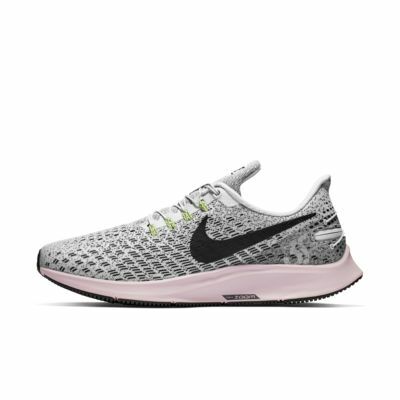 The Nike Air Zoom Pegasus 35 FlyEase has every benefit of the iconic shoe, plus effortless on and off. The laces don't need to be tied; a strap with a zip quickly secures your fit. Cables connect the zip to the laces, which can be tightened or loosened manually when needed. 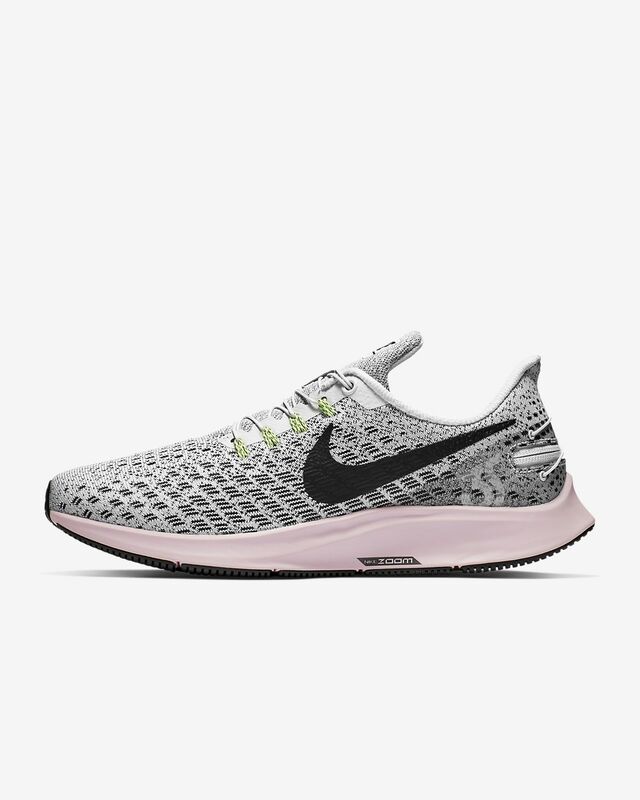 The Nike Air Zoom Pegasus 35 FlyEase has every benefit of the iconic shoe, plus effortless on and off. The laces don&apos;t need to be tied; a strap with a zip quickly secures your fit. Cables connect the zip to the laces, which can be tightened or loosened manually when needed. Zip closure adapts for easy on and off. Pull the strap to secure or remove the shoe. Flywire cables help secure the fit. Cushlon foam midsole provides soft and springy cushioning with a supportive feel. A full-length Zoom Air unit delivers responsive cushioning. Modified Waffle outsole helps absorb foot strike impact and provide multi-surface traction. These are the most comfortable shoes I have ever worn. I have plantar fasciitis. These shoes provide instant relief. I didn't want to take them off to go to bed great arch support, cushioning,, and toe box for wide feet. I am an avid runner, and I really love these shoes. They are really comfortable and I love running and lifting in them. They are a really good bang for your buck. I happily wear them all day and run 3 to 4 miles on a treadmill in them and they have such amazing support I still feel great in them. I could talk about these all day. I'm normally not a review writer...however, this shoe has been such a gift to me and my 17 year old son with cerebral palsy that I am telling anyone who will listen how great it is. While he is lucky enough to be able to walk and run without assistance now, he isn't able to do the coordinated motions needed to tie his own shoes with average length shoelaces. So, I was still having to tie his shoes for him in double knots everyday and hope that they didn't come untied at school because if they did he isn't able to retie them on his own, This also meant that he couldn't get fully dressed on his own. I know there are shoes with velcro closures for this purpose but most of those are not something that would allow a 17 year old boy to go unnoticed in high school. Those velcro shoes do nothing but draw attention to his inability to tie his own shoes. These NIKE Flyease shoes, in particular the Pegasus, are fantastic! You can't even tell that they zip up the back. The zipper and the closure are disguised in a way that unless you know to look for them, they go unnoticed entirely. They look like any other NIKE that all the other teenagers are wearing. My disabled son finally gets to wear cool looking shoes that he can manage without any assistance. Thank you NIKE for this gift! These shoes are wonderful and I hope you never stop making them.